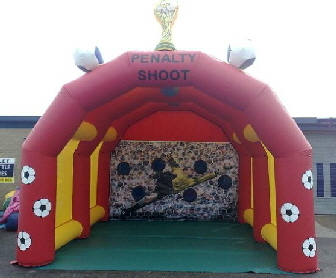 Penalty Shootout Football Game available for events of hire. Players take a shot from the penalty spot to try and get the ball through one of the holes in the back of the net. The more goals scored, the bigger the prize! But even if you’re no David Beckham - don’t worry because you win a prize even if you lose, as it’s the taking part that counts! Thinking of hiring this attraction? 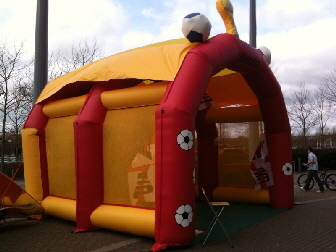 The Penalty Shootout Game is an inflatable structure and as such, it will need to be secured down if operating outside to protect it from moving in the wind. Therefore, it will either need to be staked into the ground or tied to secure points. - If operating indoors, a power supply of 13 or 16 amp will be required. The Penalty Shootout requires a ground space of 20ft x 20ft.